My biggest issue with 12 Strong, “the declassified true story of the horse soldiers,” is that it never feels likes a true story. It instead feels like stilted, tacky, and heartless attempt at a war picture. For instance, there is plenty of “the warrior is in the heart” talk and dialogue that feels like it belongs in an installment of The Karate Kid or Rocky. That probably wasn’t the intention of Danish filmmaker Nicolai Fuglsig, but 12 Strong feels more like a campy action-movie rather than a serious, war-drama. The movie tells the story of a dozen Army Special Forces (“Green Berets”) who are deployed into Afghanistan after 9/11. The group is ordered to work with a local warlord to strike down the Taliban, forcing them out of the country. Chris Hemsworth plays the leader of these soldiers, Captain Mitch Nelson. The actor recently shined in the latest Marvel film, Thor: Ragnarok, but the same can’t be said here. Where Thor allowed the actor to be charming and charismatic, 12 Strong restricts him. He comes off cold and robotic. And, not the a cold you’d expect from a soldier in a life or death situation, but a cold that makes it impossible to connect with him. 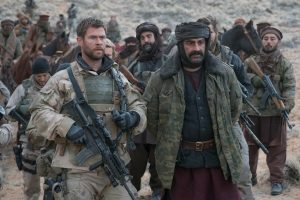 Besides Hemsworth, 12 Strong focuses on two other soldiers: Chief Warrant Officer Hal Spencer (Michael Shannon) and Sgt. First Class Sam Diller (Michael Peña). These three are the primary focus, yet none of them can give the film any heart. There are two other soldiers with minor roles, and I couldn’t tell you about the other seven—but that’s because the movie doesn’t care to look at them. Unfortunately, all 12 characters are cursory. They all have simple arcs that feel more like stereotypes than anything else. The most significant war films throughout cinematic history are the ones that have taken a look at detailed, complex character(s) and showing how war has impacted them. The Deer Hunter, Full Metal Jacket, and Apocalypse Now come to mind. 12 Strong takes a different route. The majority of the fault falls on the script. It failed to create characters that allow emotional responses from the audience. Beyond the images and footage of 9/11 in the very beginning, there is no point where I felt emotionally invested. All in all, 12 Strong is a lousy action movie under the guise of an important war movie.